Social selling is firmly established in today’s world, so how do you know if your tactics match the trend? 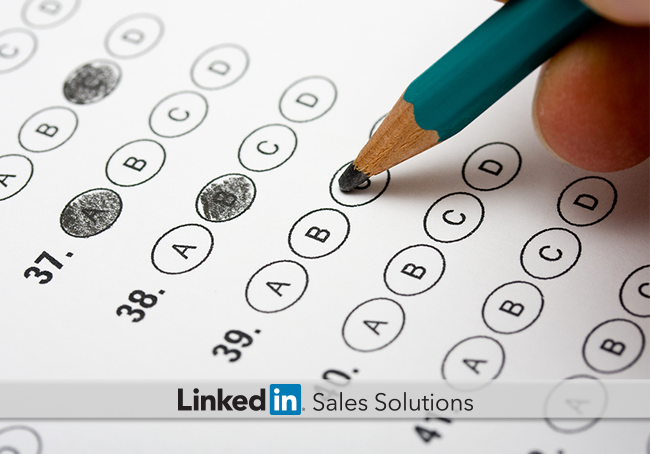 Take this LinkedIn Sales Solutions quiz to find out. Roll call: listen up sales reps and sales managers alike. Are you – or is your team – on the path to Social Selling Success? Find out and get educated on next steps wherever you land on the Social Selling Spectrum. We’ve developed this handy quiz to gauge your tactics – answer these 10 questions to see if you merit the "Social Seller" label -- or if you need to boost your efforts. Assign 1 point for responding “Yes” to a question, and tally your results at the end. We’ll have some helpful resources for everyone regardless of their current social selling level. 1. Do you have a professional-quality picture and a buyer-relevant title on your profile? Your profile is likely the first impression for the prospect – and they want to see that you are still focused on them above yourself. Avoid informal profile pictures, and use those 100 characters in the title field to expand on your role and how you serve customers. Strengthen your profile by including keywords and language that targets your audience. 2. Are you actively involved in group discussions and communities? Social selling is not a passive activity – it requires considerable engagement and relationship development. You can set up alerts to help track prospect behavior, and share your insight to develop rapport with the buying audience. 3. Do you have recommendations for your current position? Having recommendations for your current roles helps you stand out – especially if the recommendations are from customers you have already helped. 4. Do you post a mixture of unique and curated content on your profile and relevant groups? A steady stream of targeted content will raise your profile in prospect’s LinkedIn feeds – but don’t go overboard. 5. Do you utilize Advanced Search to target prospects, and do you have more than one connection within the organization? Advanced Search allows you to segment by numerous geographical and demographical factors – including title, location, and interest. You can then create a map of several influencers within a given organization – allowing you to continue relationships with that company even if a primary contact leaves or changes positions. 6. Do you use LinkedIn tags to categorize prospects? If you have several contacts within a similar industry, you can categorize them with the same keyword tags – making messages and connections much easier later. In addition, tags make it far easier to remember your contacts. 7. Do you perform extensive competitor research through Company Pages and public groups? Much of the work in social selling comes long before any connection is made. Identify the competition’s sales materials, and befriend them on their public groups. Competitive intelligence is vital to besting your rivals online. 8. Do you use conversational InMails as starter tools? Most introductory InMails serve as conversational and informal connections with a prospect. Overly-salesy language can be detrimental to your cause, so use your allotment to craft strategic InMails that benefit both the recipient and your ultimate goal of creating a warm connection. 9. Do you promote and share every event that you attend? Events are still phenomenal venues for in-person connections, but you’ll need to maintain that connection long after the event. Prepare your audience in advance with curated content from various attendees, and share your thoughts about the event as you attend sessions making sure to connect with people along the way. 10. Do you follow your customer's companies? This one’s a no-brainer. If you are following a prospect, make sure you follow their company as well. You cannot fully understand your prospect unless you research their work. Great, you’re done! Now, let’s tally those scores. Look at the key below to see how you did! 1-3: You’re not there yet – but there’s plenty of room for growth. Check out our LinkedIn social selling starter post to develop your initial resources. 4-7: Good start! You’ve dabbled in the social selling atmosphere – now it’s time to jump in. Here are some infographics to help clarify your social strategy. 8-10: Wonderful! You’re firmly established as a social seller – now learn how to convince other salespersons to follow along.